Oil pressure is one of the most important parameters in an engine. When your vehicle’s oil pressure light comes on or the pressure gauge reports a lower than normal reading, it could signal a major problem. Unfortunately, you won’t know whether the issue is serious, so the best course of action is to simply turn off your engine. To help provide a better understanding of engine oil pressure, this article will explore the possible causes of low oil pressure and the most effective ways to remedy it. The oil pressure in an engine can be low for a number of reasons. When the pressure gauge detects low oil pressure, be aware that it may be real or just an inaccurate reading. In any case, it helps to understand some of the most common causes. Even if the correct amount of lubricant has been added during an oil change, the oil may be unduly consumed due to evaporation, burning caused by worn piston rings, and leaks through the seals or oil plug. Oil consumption increases as the engine ages, so checking the oil level and topping up may be a simple solution. However, if leaks are evident outside the engine or there are oil drops on the floor, the leaking component should be fixed as soon as possible. When an engine is old, it will burn more oil. When the engine consumes a quart of oil every 1,000-2,000 miles, an overhaul is needed. If the oil change interval is overextended, the oil level could be quite low, even if the engine is not very old. Therefore, follow proper oil change intervals and check the oil level periodically. When oil viscosity is too low or high, it may be detected as a loss of pressure in the oil supply to the engine. Low viscosity generates less resistance to flow through the system, which is translated as lower pressure by the pressure gauge or sensor. Viscosity that is too high may produce greater resistance from the oil being pumped, leading to a lack of lubrication in the system and consequently lower pressure. In an engine, oil viscosity is influenced by the original lubricant viscosity selected, the operating temperatures, the breakdown of viscosity index improver additives and the presence of contaminants such as glycol and soot. The engine or car manual should specify the recommended viscosity grades according to the equipment’s design and the ambient temperatures where the vehicle will be operating. A higher viscosity selection may be a concern, particularly for engine startups in cold weather. In extreme low temperatures, not only must you choose the right lubricant viscosity, but you may also need to use an oil heating system. 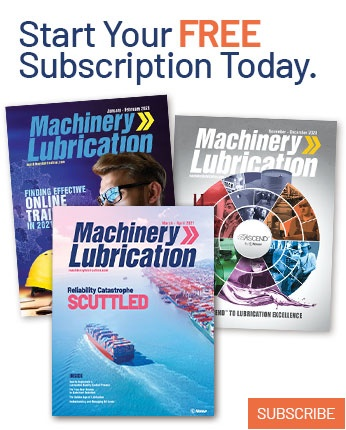 Low viscosity can be the result of a variety of factors, such as fuel dilution, incorrect lubricant viscosity selection, or excessive temperatures due to overloading or a cooling system failure. 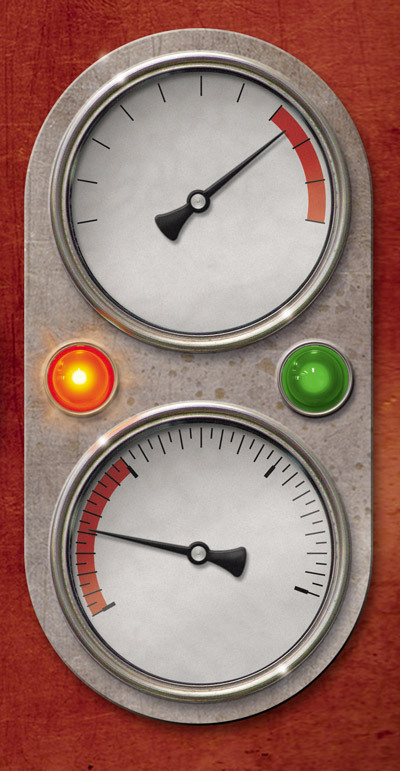 In diesel engines, the pressure gauge typically reports real-time pressure in pounds per square inch or bars. Some lubricant manufacturers produce lubricants with a lower viscosity that is still within the range of the SAE grade. A lower viscosity offers better fluidity through lubrication systems but may result in lower pressure in the pressure gauge. If the pressure is within the normal range, there is no cause for concern. You may find that some lubricants produce higher pressures than others. If the oil level on the dipstick is between “add” and “full,” a possible cause of low pressure would be worn engine bearings, especially if the engine has very high mileage. Excessive wear reduces the original flow restriction, which consequently drops the pressure. If this is the case, the engine likely will need to be rebuilt or replaced. If the oil pressure warning light has come on but you have confirmed that the oil level is correct and the engine is running normally with no unusual noises or high temperatures, the problem may be a defective sensing unit. You may wish to have the oil pressure tested with a gauge. If the pressure is normal, simply replace the oil pressure sensor. However, if the warning light or low gauge reading continues after replacing the sensor, the problem is likely a bad oil pump. If the oil level on the dipstick is between “add” and “full” but the engine is running noisily, the oil pump may be worn. A worn pump is unable to generate the necessary pressure due to internal leaks. Stop the engine until the issue can be fixed. A pump replacement will be needed. In a lubrication system, the pressure gauge is installed after the filter. If the filter becomes clogged with contaminants and the bypass valve does not operate correctly, it may lead to lubricant starvation. A clogged filter is often the result of an overextended oil. It may also be caused by water and/or soot contamination. Water typically comes from a cooling system leak, while excessive soot may be the result of poor combustion. If the bypass valve is not working properly, a defective filter may be to blame. 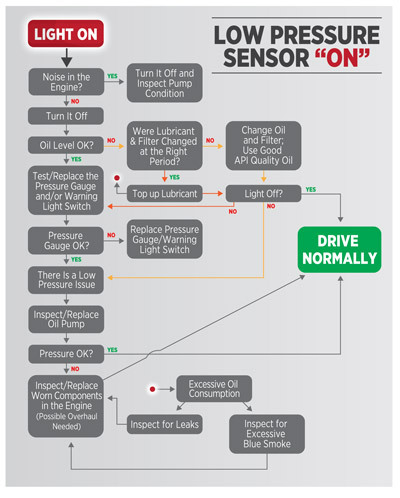 Above is a flow chart detailing the inspections and corresponding actions for low oil pressure in an engine. To reduce the risk of low oil pressure in your engine, change the oil and filter at the correct intervals. Also, use high-quality lubricants, including the right viscosity grade and appropriate quality standard specified by the American Petroleum Institute (API) in the engine/car manual. Be sure to check the oil level periodically and inspect your engine (and garage floor) for leaks. In addition, watch for blue smoke emitting from the exhaust, particularly with high-mileage engines. Do not drive your car if the pressure sensor is on and you don’t know what the problem is. For fleets, employing oil analysis to determine the condition of the oil and machinery will be the best predictive/proactive strategy. An engine’s lubrication system is essentially formed by the pump, oil filter, lubrication lines and hardware. The pressure in the system is generated by the resistance that the oil must overcome in the lines to reach the lubricated components. A pump is used to force lubricant through the system. When an engine is in the design stage, the pump is engineered to generate the required pressure and flow to allow the lubricant to circulate to the most remote component. When the oil pressure is low, it indicates something is not working properly. It also means there likely is not enough lubricant moving through the system. 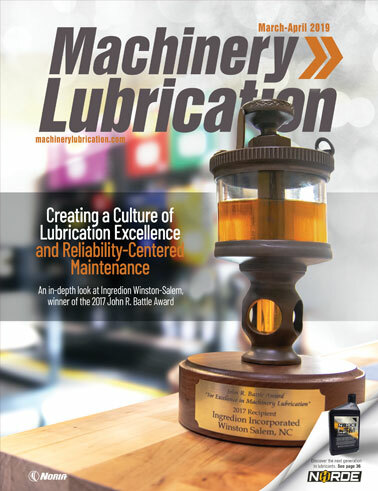 Keep in mind that lubricant starvation will lead to metal-to-metal contact and machine failure. Depending on the severity of the situation, an engine can fail in a couple of hours or even a few minutes. The repair could also be costly, with most of the engine needing to be replaced. Viscosity affects oil pressure. If you were to pour oil on an inclined surface, it would flow downhill due to the force of gravity. The higher the viscosity, the slower the lubricant will flow. Viscosity can be defined as resistance to flow. Lubricant viscosity varies with temperature, decreasing when the temperature rises and increasing when the temperature drops. Therefore, engine oil viscosity will be dependent on the engine’s ambient temperature during startup as well as its normal operating temperature. There are two common ways to measure viscosity. The first involves allowing oil to flow through a capillary tube and recording the amount of time it takes to flow from one point to another. Viscosity can also be measured by putting the lubricant in a calibrated cup and stirring it. The higher the viscosity, the more difficult it will be to stir. This resistance is calculated by a lab torque-​ meter. Tests are performed at precise temperatures for consistent results. Most vehicle owners are familiar with the viscosity grades developed by SAE International, such as SAE 30, SAE 40, etc. These standards, which are based on the measurement systems described above, simplify the process of selecting the right lubricant for your engine. An SAE grade, such as SAE 40, has no single viscosity value. Instead, it denotes a viscosity range with a minimum and maximum limit. Lubricant manufacturers have the freedom to formulate their lubricants within the accepted viscosity range for a specific grade. SAE grades that contain a “W” refer to lubricant viscosity and pumpability at low starting temperatures. Lubricants without the “W” designation may be too thick during winter temperatures.